(ii) Must have passed the Government Technical Examination in Shorthand and Typewriting in English - Higher/Senior Grade. (iii) Must have passed the Certificate Course in Computer on Office Automation conducted by the Directorate of Technical Education. Desirability: Having working knowledge in Computer or application of computer in the day-today functioning of Office. (i) Any Bachelor Degree in Science, Arts, Commerce, Engineering, Medicine, or any other discipline of a recognized University, in Indian Union in 10+2+3 or 11+1+3 pattern. (ii) Must have passed the Government Technical Examination in Shorthand and Typewriting in English and Tamil - Higher / Senior Grade. Desirability: Having working knowledge in Computer or application of computer in the day to day functioning of Office. * Relaxation as per Section 61 of Tamilnadu Government Servants (Conditions of Service) Act, 2016.
a) 02.07.1988 (in case of “others”). b) 02.07.1983 (in case of SC/SCA/ST/MBC&DC/BC/BCM). c) 02.07.1973 (in case of in-service candidates). d) 02.07.1978 (in case of persons appointed under 10(a)(i))]. The applications are to be submitted by both means viz., (a) through e-mail (soft copy) and (b) by Offline method (hard copy). 1. The application form shall be downloaded from the Madras High Court website. 2. The filled in application (soft copy) without annexure should be sent through email at recruitment.mhc@gov.in on or before 02/05/2018. No acknowledgment will be issued with regard to the e-mails submitted once and the candidates are required to verify all the details mentioned in the application before sending the e-mail. NO FURTHER CORRESPONDENCE IN THIS REGARD WOULD BE ENTERTAINED by e-mail. 3. 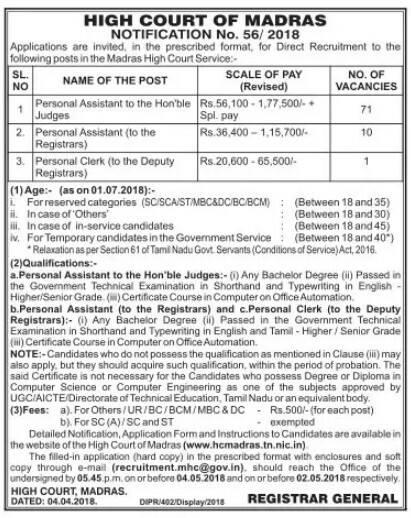 A print out of the Application submitted through e-mail shall be sent, along with required enclosures and the Demand Draft (if need be), by Registered post to the Registrar General, High Court, Madras 600-104 and the same shall reach the office of the High Court, Madras 600 104, on or before 04/05/2018, by 5.45.p.m. 4. Only one e-mail application shall be submitted by the applicant for each of the posts notified. 5. Candidates shall submit their application by two means, viz. hard and soft copies. Omission of any one method will lead to rejection of application. 6. The filled in application form received through e-mail will be accepted, only if the hard copy of the same should reach the Madras High Court on or before the last date. Otherwise, the application will be summarily rejected. 7. If the filled in application form along with the enclosures reach the office without valid e-mail application, the same will be summarily rejected. 8. Any variance / difference between the soft copy (e-mail filled in application) and the hard copy (filled-in application form) the application will be summarily rejected. 9. The incomplete application without prescribed/required enclosures (in hard copy) and the applications received after the due date will be summarily rejected and no further communication/representation in this regard will be entertained. The High Court will not be responsible for the postal delays. 10. No separate acknowledgement will be sent to the candidates, for the receipt of the applications received by post also.